The Mane Six are split up as they continue their rescue mission. It’s hard to describe how much I love this series without sounding like a broken record. The writing is great, the art is spectacular, and it matches the charm and fun of the animated series it’s based on while still feeling new and original. After only three issues, it’s become my favorite comic book series in a long while, and I can’t tell you how delighted I feel with every new issue that arrives in the mail. In this issue, Queen Chrysalis reminisces about her defeat from “A Canterlot Wedding” and her plot to get revenge on the pony who brought about her downfall, Twilight Sparkle. Chrysalis, along with her loyal minions and Cutie Mark Crusader prisoners, continues to spy on Twilight and company, who have since split into three separate groups to get to the Changeling Kingdom. Katie Cook has her deck full on the character side in this issue, having to juggle the pairing of Twilight and Fluttershy, Applejack and Rarity, Rainbow Dash and Pinkie Pie, as well as Spike, Queen Chrysalis, The Cutie Mark Crusaders, and a few others. Luckily, not only is she able to give each pony their due time on the page, she makes it look easy. The dynamics between the ponies is spot on, with Rainbow Dash and Pinkie Pie bringing the most laughs (and yes, I laughed while reading this issue.) The separation of the ponies allows each group to discuss their current situation while at the same time reflect on what’s happened already. Cook does a good job of keeping these moments entertaining as well as fleshing out the characters in the quiet, and not so quiet moments. Cook knocks it out of the park, however, with the interaction between Chrysalis and the Cutie Mark Crusaders. Applebloom, Sweetie Bell, and Scootaloo get more screen time here than in previous issues, and it’s just funny to see them bounce off the charismatic Queen Chrysalis. The trio’s random thoughts about past adventures combined with their heartfelt defense of their would-be rescuers helps round them out nicely. 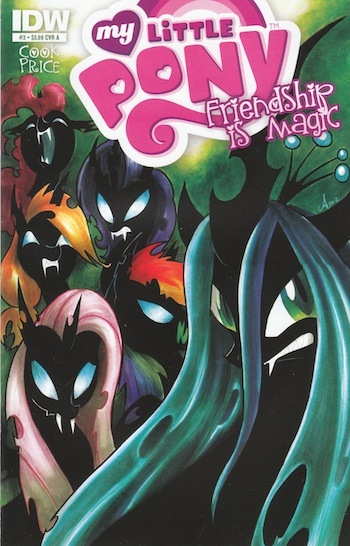 Chrysalis once again steals the show with her indelible charm and venomous remarks towards Twilight and her friends, and makes her one of the most entertaining, and likable, villains I can recall from a comic. Once again, Andy Price and company bring great artwork to every panel on the page. His expressions really let’s us know what characters are thinking or how they’re feeling without any dialogue necessary. Seeing some of the reactions is part of the fun as you really have to look at the characters to make sense of some scenes, like when one of the Crusaders tells a bad joke while the other Crusaders look at her, almost disgusted. Not only that, the amount of visual variety and colorful environments really give a pleasant atmosphere to the issue. While this issue is full of happy and funny moments, there are some really dark and eerie moments to go along with them. There’s one panel of an angry and carnivorous Queen Chrysalis that looks so cool, and is unlike any other image of her in the entire issue, it just has to be seen to be believed. Once again, My Little Pony: Friendship is Magic is a comic book series well worth the time of any fan of the animated series or all ages comic book adventures. It really is a great book, and one I look forward to each and every month. I hope you check it out; if you’re in the market for some good old-fashioned fun in Equestria, you won’t be disappointed!